Scottish dances as they have been danced for centuries at court and in the village inns: not the war dances of the Highlands with swords and bagpipes, but ladies and gentlemen enjoying the reels, jigs and strathspeys to traditional music. Scottish Country Dancing is the social dancing of Scotland. No festivity, no social gathering, no ball without at least one "set" of four couples dancing. Noblemen and peasants, old and young have enjoyed the lively reels and jigs or the slower, more elegant strathspeys for centuries. Influenced by the French court, Italian dance masters and traditional steps and tunes, this dancing is still a living tradition. Wherever the Scots went, they took their traditions, music and dances. You can find the joyful sound and the colourful tartans of the different clans all over the world. 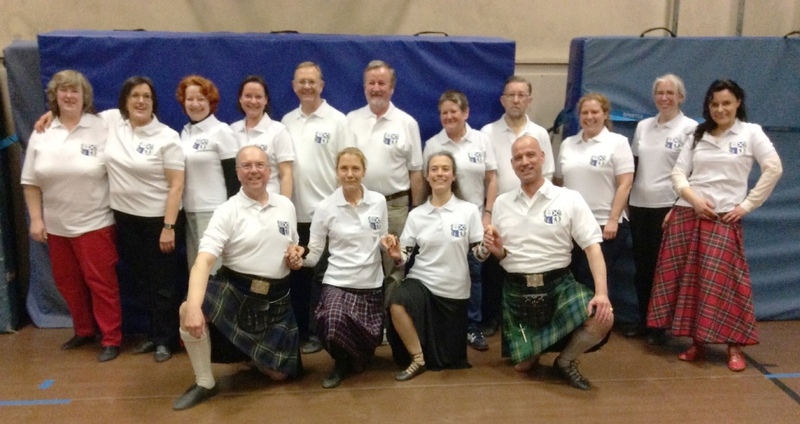 The Scottish Country Dancing Society of Berlin was founded in 1974 by Christopher McLarren. In 1978 the group became affiliated to the Royal Scottish Country Dance Society in Edinburgh whose patron is Her Majesty Queen Elizabeth II. On 25 October 2013, our active dancers qualified for the "Deutsche Sportabzeichen in Bronze" for (German Sport Badge in Bronze) for folk dancing. We qualified for the silver badge on 20 June 2014 and gold on 24 June 2016. The members of the group are mostly German, British or American. People of all generations meet every Friday to enjoy their social hobby and to foster the Scottish culture even in Berlin! Bring soft, comfortable shoes and join us Friday nights. Everybody is welcome.